The convention will be at the Titan Student Union. If you’re driving, park in the State College Parking Structure on the CSU Fullerton campus. Parking is $8 on Friday from 7 a.m. to 5 p.m. and free over the weekend. 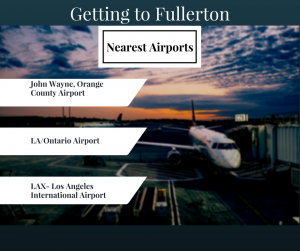 The nearest airports to the Convention site are listed here. Make sure to book your rooms today! 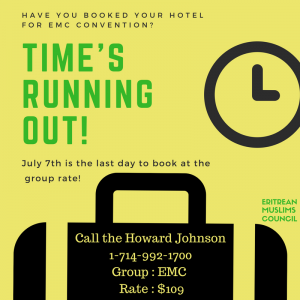 In order to get the discounts, identify yourself as EMC Convention members at the time of booking. Only registered participants will be allowed to attend, so register now using the link above! 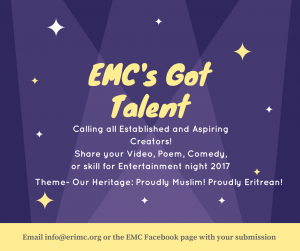 All content that is to be presented in the EMC Convention, including Entertainment Night, Youth and other subgroups, has to be per-approved by the EMC Convention Committee and EMC Board. Group skits/shows should not exceed 15 minutes. Individual ones should not exceed 3 minutes. 3 minutes is a lot longer than you think. In general, just remember, this is an Islamic organization having and Islamic event. 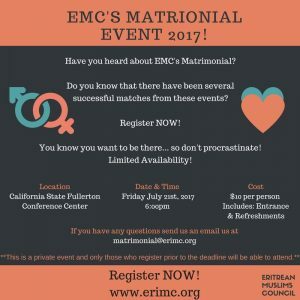 The EMC Matrimonial event is a great way to meet new people! It will be hosted on Friday, July 21st, 2017 at 6PM. 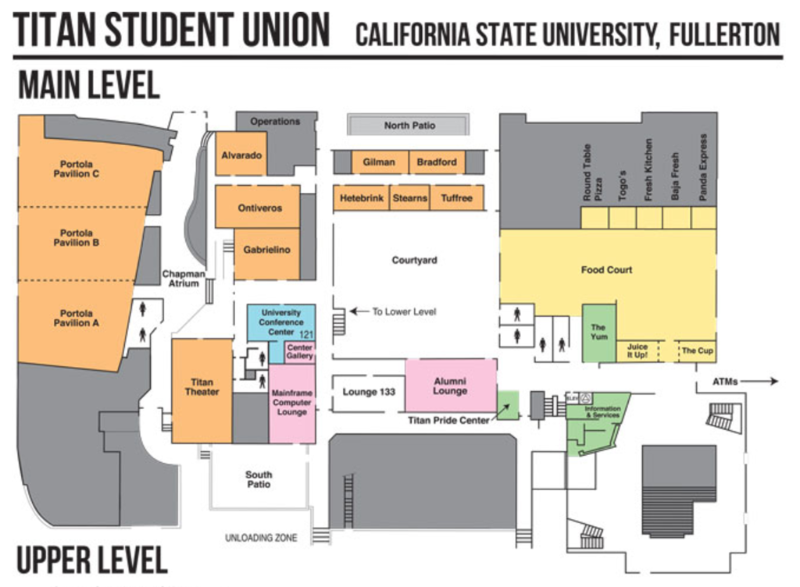 The location will be the California State Fullerton Conference Center. There is limited availability so please register here. Are you a professional looking to meet other young people in your field? A professional looking to discuss opportunities? Or maybe just looking to network. 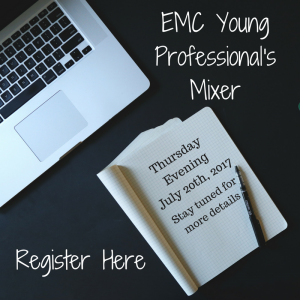 EMC’s Young Professional’s Mixer is just the event for you. It will be hosted the evening of Thursday June 20th with the exact time and location to be announced soon. 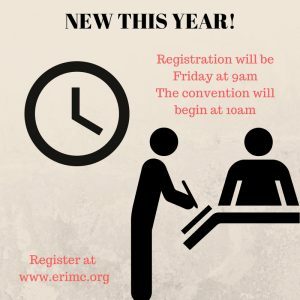 Want to present at the EMC Convention? We’re looking for more passionate, dynamic speakers and workshop ideas for the upcoming convention. 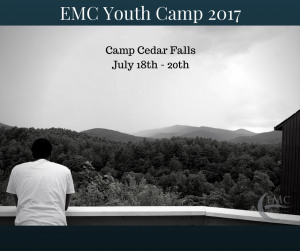 If you’re interested in presenting during the youth leadership camp or the main program, we want to hear from you! Send us your proposal via this form.